After the EIS for FPSOs was approved by MMS in late 2001, 2002 was the first year when FPSOs could really be considered for field developments in the U.S. Gulf of Mexico. SPE held a conference on that topic: the presentations preserved here give insights into industry thinking at the time. Interest was strong, with more registrants than at any FPSO conference in Gulf of Mexico to this day!. It was conceived, organized and chaired by Peter Lovie. The positive outlook of 2002 is far different from today! Macondo in 2010 was a bad oil spill disaster, following on the 1969 spill at Santa Barbara Channel and he 1989 spill at Valdez, with these spills at roughly 20 year intervals increasing geometrically in size. And yet human experience learned from disasters (e.g. Tay Rail Bridge disaster in 1878, Titanic in 1912, Challenger in 1986, and others) and cited in conference presentations here. Dr. Irving Finkel at the British Museum in London wrote in his 2014 book “The Ark Before Noah” that clay tablet records revealed that Noah’s Ark was round instead of boat shaped. Reading the book, it turned out that the Ark was also almost exactly the same diameter as the first ever round FPSO that entered service at Piranema in 2006. This historical precedent raised the entertaining thought that patent lawyers behind these new round FPSOs and MODUs may have to contend with prior art of truly biblical proportions! There are many other papers and presentation from Peter Lovie over the years that are listed in the Library page. They draw on his broad management and engineering experience from working for FPSO and shuttle tanker contractors and then for an operating oil company. From 2H2009 to 2015 he served as an independent “Senior Advisor, Floating Systems”. As the oil bust progressed he turned to writing two books on events he had had a hand in. 2018 was a turning point. The Oilfield Energy Center inducted Peter Lovie into its Hall of Fame as an Industry Pioneer, joining other industry leaders and a great honor. The two books were published - the first book was released in late 2018 and the other in early 2019. “WHY ONLY TWO FPSOs IN U.S. GULF OF MEXICO? The website for the book has a full description, downloadable papers and links to the various online book sellers around the world. 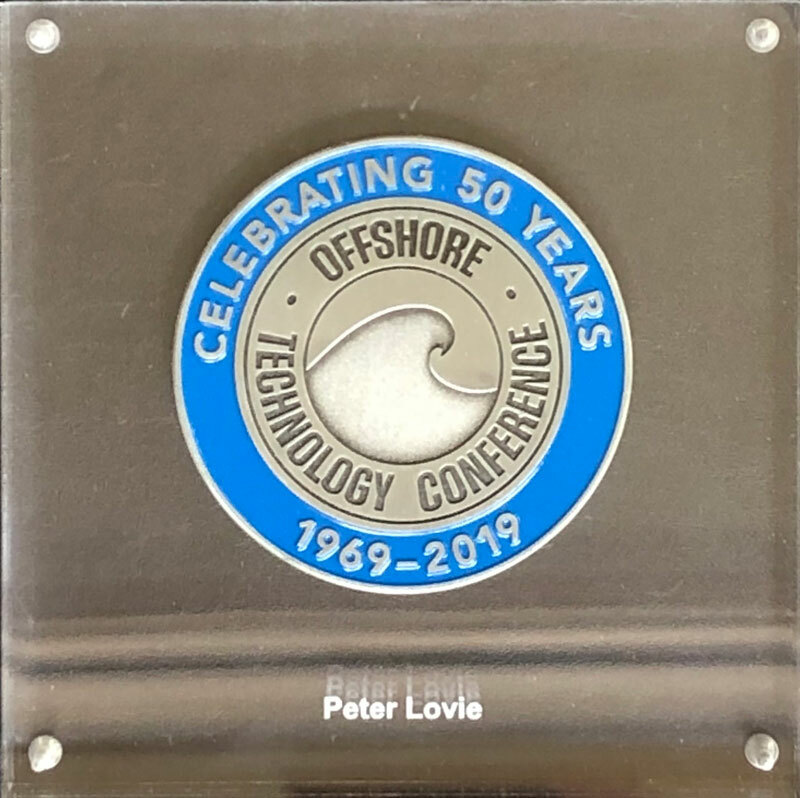 At a ceremony in Houston on Saturday September 15, Peter Lovie was inducted as an Industry Pioneer into the Hall of Fame established by the Oilfield Energy Center (OEC). Although OEC is located in Houston, the world’s oil capital, Industry Pioneers are selected from all over the world. It was quite an evening, impeccably organized: first the video interview, then the Induction Ceremony, then the Annual Gala Dinner with about 800 top oil industry people. The five images in the attachment give an idea of the Hall of Fame Induction Ceremony. The Offshore Technology Conference (OTC) had its first conference in 1969 in downtown Houston at the Albert Thomas Convention Center. The event ash condtintue , clelbrastign tis fiftieth confence in Houston in 2018. SPE tracked down people who had attended every year since OTCs started and found a surprisingly small number still around – they had contact with only eight – one of which was Peter Lovie. They were deemed “OTC Legacy Members” and recognized with an OTC medal encased in Lucite. March 14 is a historic date. It is the birthday of Albert Einstein. March 14 (3.14) is also Pi Day when the greek letter Pi is celebrated (no joke – more at www.piday.org ) And in 2018 March 14 is when history was made with SPE’s online version of The Journal of Petroleum Technology publishing Peter Lovie’s latest article “First Person: Oilfield Success of “Millennials” in the 1970s Might Offer Encouragement Today”. The latest updates dated 16 May 2017 to "ETA and its Jackups: the Six Year Saga" has been posted on www.ETAanditsJackups.com Click on link for more information and to download the 73 page piece. Pennwell’s Topsides Platforms & Hulls conference added an FPSO Track this year. Peter Lovie was lead developer on the FPSO Track, gave the opening presentation on “FPSOs in the US GoM - a 21 Year Saga” and moderated the Closing Panel. appeared on their “Head to Head” page dedicated to an individual Upstream feels has done significant things in the industry. Upstream did similar interviews a few weeks earlier with Saudi Arabia’s Oil Minister Khalid al-Falih (24 June) and with US Senator Lisa Murkowski (20 April). Article in Maritime Reporter issue of June 2016, pp. 40-42. The views of Peter Lovie on the outlook for the FPSO business are quoted in this 5 page article as part of a discussion on how the next few years may go for marine professionals. This presentation examines the emergence of the round hull in the contexts of FPSOs in today’s offshore world and for other uses of the round hull concept in modern times and in antiquity. Talks about technology and development of business, history and a little entertainment! Given at ACI’s 7th FPSO Conference in Houston on 4-5 November 2015, 33 slides. Brief opening remarks at ACI’s 7th FPSO Conference in Houston on 4-5 November 2015: see slides 2, 3 and 4. The Royal Institution of Naval Architects in London has published in the 3Q 2015 issue of their Offshore & Marine Technology journal, pp. 10-13 - some thought provoking entertainment. The Offshore magazine article, pp 108-111 tackles a common phenomenon in FPSO projects which has in a few instances had a serious effect on the survival and financial health of the FPSO lease contractors. In many cases it has given that industry a bum rap where projects did indeed need to overrun for sound field development reasons. It is a sensitive theme with industry leaders now addressing it via better project definition, via FEED, plus growing management attention on both sides of the table, implying the timing for change is good. Ideas for improving matters are mooted in “Closing Thoughts” in this four page download. He had served as Program Chair for the 2012, 2013 and 2014 FPSO Forums. “US GoM FPSOs + Shuttle Tankers: Evolution, Drivers and Outlook”: how we got to where we are in US GoM, outlook and new information on shuttle tankers. Peter Lovie’s presentation was at 5th FPSO Vessel Conference, Active Communications International (ACI), Houston, 31 slides. View the presentation - Be sure to click on the map in slide 18 to see the 30 second animation and hear the sound effects! “TRLs as a Metric in Gauging Progress on Technology and Commerciality”: a two part series by Peter Lovie, James Pappas and Tom Williams in Hart’s E&P, 7 pages. “Point by Point: The Business of FPSOs”, an interview of Peter Lovie and two others by Audrey Leon, Managing Editor of Offshore Engineer, pp. 26-29, 30, 32-33. 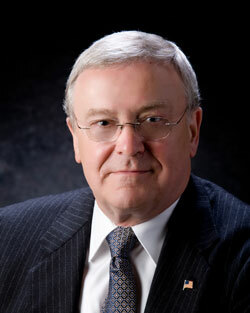 As in 2012 and 2013, Peter Lovie serves as Program Chair and as one of the Session Moderators. SNAME’s Marine Technology published their version of the article. The Final Report on RPSEA project 10121-4407-01 “Deepwater Direct Offloading Systems” was signed on 8Oct13 and published by RPSEA on 28Mar14, is now in the public domain for anyone to download the 330 page (5.2 MB) Final Report, and 292 pages (3.5MB) of Appendices, all at www.rpsea.org/projects/10121-4407-01/ .Peter Lovie served as Principal Investigator for RPSEA on this project during 2012-2013. Peter Lovie was invited to comment on the Final Report Presentation delivered by RPSEA on their Project 10121-4407-01 Deepwater Direct Offloading Systems. This eight page paper on “Conclusions and Discussion” includes his technical and commercial observations from his responsibilities as Principal Investigator on the project. - View the presentation "Conclusions and Discussion for Final Report Presentation"
Presentation on “Economics, Performance - Four Options for US GoM Offloading” given at the Third Annual Emerging FPSO Forum in Galveston on 26 September 2013. It relates 2007-2008 work at Devon Energy that was reported in DOT 09 with work in a recently completed RPSEA project, funded via US Department of Energy, on offloading in GoM. Peter played a lead role in establishing the program for the Third Annual Emerging FPSO Forum in Galveston. He moderates the opening session on “State of the Business” and in the session on “FPSO Offloading in GoM” he presents on “Economics, Performance - Four Options”. View the presentation "Developments in the Ultra-Deep waters of the U.S. Gulf of Mexico"
Peter moderated two sessions at this event in Galveston. The first was on offloading for US GoM. His second session was on round FPSOs, a shoot out on the different round FPSO designs on the market: read the lop sided vote by the FPSO community that was there, on ship shape FPSOs versus the round FPSO designs from Sevan, SSP and Deepwater Structures. "Impact of Logistics of FPSO Production on Markets", Argus Americas Crude Summit - Shifting Import Dynamics, Houston, 25-27 January 2012, 29 slides. "At Last, an FPSO in US GoM! ", Marine Technology Society, Houston, 27 Slides. "What's Next for FPSOs in US GoM? ", IBC Energy, 26th Annual FPSO Conference, London, 27 slides. "Tankers V. Pipelines in Ultra Deep GoM", International Offshore Pipeline Forum, organized by ASME, 21 slides. "Why so Long for an FPSO in US GoM? ", Emerging FPSO Forum, Galveston, 18 slides. "FPSO Tales of the Unexpected", Offshore Engineer, August 2011, pp. 20-21. "Spec Build FPSOs Dangerously Risky", Offshore Engineer, February 2011, pp. 24-25. Lovie quoted in Oil & Gas Journal article. Selected comments from the Contractors' Panel at IBC's 25th annual FPSO conference on 14 Dec10 in London. "Lack of FPSOs in US Gulf Limits Appeal of Shuttle Tankers", Lloyds List. 17 December 2010, 1 page. The premier event for the FPS sector, Global FPS 2010 will focus on market trends, commercial drivers and the technical challenges of developing offshore oil production and associated gas. Titanic, Challenger and now Macondo: mankind learns from disasters but the outlook for FPSOs in US GoM? "The First FPSO in US GoM: the Fourteen Year Journey", Society of Petroleum Engineers, Projects, Facilities & Construction Group, presentation at lunch meeting, Houston, 18 May 2010, 28 slides. "The First FPSO in US GoM: the Fourteen Year Journey", Journal of Petroleum Technology, May 2010, part 2 of 2, pp. 32-35. "The First FPSO in US GoM: the Fourteen Year Journey", Journal of Petroleum Technology, April 2010, part 1 of 2, pp. 36-39. Three Case Histories on the Risks, Timing, Business & Regulatory Impacts on Acceptance of New Technologies in the US Gulf of Mexico.